We all have different schedules, and a vast majority of people are required to work into the late hours of the night, then sleep through the normal hours of the day. However, this could be a challenging situation if the sun is constantly shining through the cracks in your window. For nurses, firefighters, police officers, and others who regularly work the graveyard shift, see the below suggestions; you deserve a full night’s rest! Not just for those with a 60 hour work week, masks can be extremely beneficial to people who have frequent, long lasting migraines and light sensitivity. How Does Sleep Loss Affect Your Body? When your body is deprived of rest, the long term results can be detrimental to your health. Humans need at least 8 hours of sleep per day, without it you’ll begin to have mood swings, difficulties staying focused, and you may start to gain weight. After several days of little to no sleep the consequences may be quite a bit more severe; your emotional health will start to falter, you may begin to have bouts of depression, hallucinations, and extreme paranoia. Some people experience periods of sleep that they are unaware of, their bodies are shutting down and forcing sleep upon them. If you are experiencing any of these symptoms, do not drive or operate heavy machinery, doing so could lead to accidents and injuries. What’s Important In a Sleep Mask? Material- When you’re trying to sleep, the last thing you want to experience is a scratchy, tight, uncomfortable mask on your face that shifts around and lets in light. Search for a sleeping mask that is made from soft materials such as silk, cotton, polyester, or satin. Silk is usually the best option because it has hypoallergenic properties that help to avoid contact dermatitis, a skin allergy; this special fabric also has a natural ability to repel dust mites. Avoid products that are heavily set in dyes, they can aggravate sensitive skin and rub off on your sheets and pillow cases. What is the purpose of your mask?- If you’re using your sleeping mask for the exact purpose of getting rest, one that falls flat across your face may not be an issue as long as it isn’t too tight. However, if you’re dealing with migraines, fevers, or other painful ailments, try a compression mask or one that has built-in freezing capabilities. For those who prefer not to have any pressure on their eyes at all due to irritation of the eyelids or to protect eyelashes, you’ll want a product with contouring around the eyes. The purpose behind your purchase is important and should be considered before you buy anything. You don’t want to get the wrong thing and end up regretting your purchase! Like shoes, the size and length of the straps matter- A very common factor that people see as a downside in sleeping mask products are the straps. If your strap is the wrong size, or made from a weak material, it will either break after a few days of use, loosen up, or it won’t stay put as you move through the night. Avoid plastic clasps and look for masks with adjustable Velcro straps, they’re more reliable, better in quality, and much easier to use. Masks with a single straps tend to lift from the bottom which allows light to seep in, look for a mask with at least two straps for a more secure fit that won’t bend after weeks of use. With over 10,000 customer reviews online, this sleeping mask has to be one of a kind. Made from 100% Mulberry Silk, your mask will keep the light out of your eyes without creating heat or making you sweat. Including an adjustable, Velcro strap that stretches from 15.8 inches to 27.6 inches and stays flat, you’ll never wake up with your hair in a tangled mess. While there have been some complaints about the strap, these items should be considered defective as the majority of these masks are recommended by consumers. Almost 80% of customers approve of the Alaskan Bear Natural Silk Sleep Mask, and those with with migraines and sleep cycle issues have had positive experiences using this product. With the PrettyCare 3D Sleep Mask you’ll have plenty of cushion to keep your eyes unbothered while you sleep. This mask is designed with functional contouring to keep the pressure off of your eyes and nose. Made with high dense Memory Foam, this extremely light mask only weighs an impressive 0.4 ounces, and the strap can be adjusted anywhere from 9 centimeters to 20 centimeters. The band should rest comfortably around the upper back part of your head, rather than next to the ear where rubbing can occur. 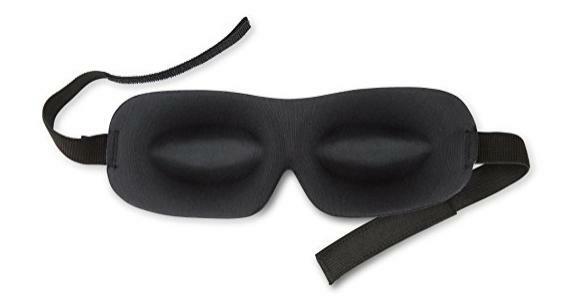 People who have ordered this sleeping mask were generally pleased with how this mask blocks out light and doesn’t leave any markings on their face. This product also comes with a kit, so you can keep both your masks and your ear buds all in one place. Whether you’re travelling around the world, or flying across cities and state lines to facilitate business meetings, you still need a full eight hours of sleep to stay on top of your game. With the Jersey Slumber Sleek Mask, you can catch your red-eye flight without actually having red eyes. It’s small, durable and the smooth silky texture will help you get to sleep right away. 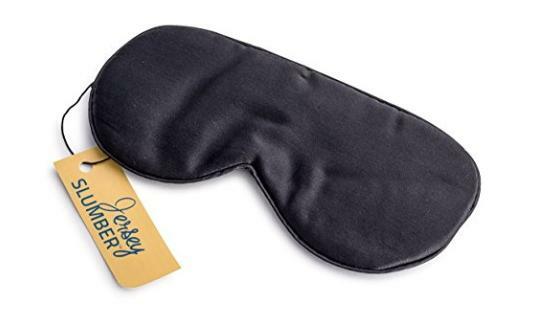 Don’t bog yourself down with extra baggage, this sleeping mask is travel size and easy to place in your luggage. If your mask happens to get dirty during your travels, not to worry. This product is machine washable and won’t fall apart after a few months of usage. The Jersey Slumber 100% Silk Sleep Mask will keep your concentration on point to guarantee you a successful proposal at your business dinner! Perfect for the whole family, the YIVIEW Sleep Mask Pack of 3 comes in handy when you’ve got a household full of people, or if you just need a mask for home, for late nights in the office, and to carry with you just in case. The 3D contour design eliminates pressure on your eyes while remaining secure around your head. Some 3D-style sleeping masks can be a bit stiff, but the YIVIEW is meant to be conveniently flexible. This product is machine washable with cold water. With over 1,000 customer purchases and a 4.5 star rating online, this sleeping mask is popular among consumers. Use one for yourself, and share the gift of a well-rested evening with your friends and family. So far, those who have purchased this item in 2018 have had mostly positive experiences. 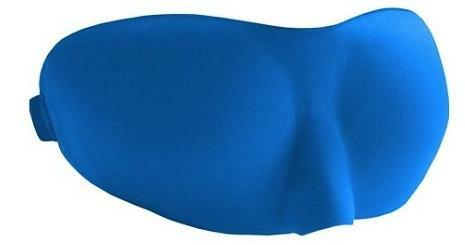 Unlike other sleeping masks, this one is actually meant to have a snug fit around the face. People who suffer from migraines and pressure headaches, the IMAK is built to stay cool and create a soothing compress for your head pain. The flexible material will contour to the grooves of your face, blocking out light and staying in place as you shift positions throughout the night. This mask can also be placed in the freezer and will create a cooling effect the next time you use it. The IM AK Compression mask is small, freezable, and makes for the perfect gift for loved ones who need help getting to sleep. This product is highly recommended for those who are ill or trying to recover from a fever, it will definitely keep you cool. As a suggestion, wrap your mask in a paper towel and store it in a plastic bag while freezing. This will prevent moisture from seeping into your product and ensure that it lasts longer. Purchased by over 10,000 consumers, the Sleep Mask by Bedtime Bliss is a celebrated and crowd-pleasing product. This mask won’t create excess heat that causes you to sweat in the summertime, and the contouring around the eyes add extra comfort. Since this mask has more than one strap, you can buy it for anyone! 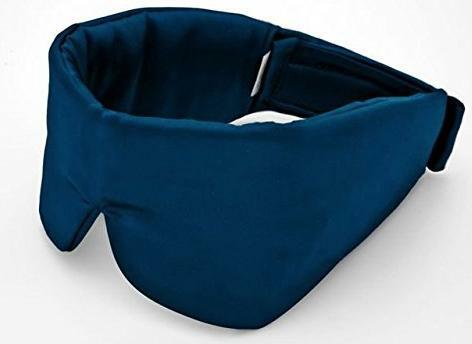 Man, woman, or child the Sleep Mask Bedtime Bliss mask is capable of helping anyone who needs to hit sheets and get more rest. Something to keep in mind about the Sleep Mask by Bedtime Bliss is that this company is working on updating their designs. Previously, customers have purchased this mask, found that they were very happy with it, and decided to purchase a second one. Upon arrival, the second one may have been constructed differently, which has been displeasing to some. However, these issues occurred mostly between 2016 and 2017 and should not be a problem for future customers who want to buy the Sleep Mask by Bedtime. If you have sensitive skin, the Sleep Master is soft and gentle on your face while still remaining place as you shift positions. This product gives you full coverage from light, so if you need to take a nap in the middle of the day you can do so with ease. Made from hypoallergenic material, those with dust mite, dye, and skin allergies can use this mask as well. Due to the volume of complaints on dye stains, it would be best to soak this mask in cold water, or lightly rinse and dry it by hand. This way you can avoid any issues with damaged sheets or dye absorbing into your skin. While it is not particularly dangerous, dye can cause allergic reactions such as contact dermatitis with people who have exceptionally sensitive skin. When purchasing this mask, is it also important to consider that you may need ear plugs for extra noise control. Available in blue, pink, gray, and black, the versatile Lewis N. Clark Comfort Eye Mask is a top selection for online shopping. Other masks can fall apart after multiple uses and begin to fray after spending too much time inside of a washer and dryer. This product only needs a light a rinse with mild soap and will be just like new, it won’t leave behind a funky scent either. The Lewis N. Clark mask is made from a durable, nylon rip-stop material that will keep wear and tear from ever being an issue. The flexible cotton liner prevents clumping, and still gives you enough cushion for comfort without letting in sunlight. Customers have left great reviews on this product, however many have suggested that the lighter colors, such as pink, gray, and blue don’t block out sunlight as effectively as the black. People have also mentioned that this mask has an excellent value for the price. The special contouring around the mask prevents excess pressure on the eye sockets and is designed to protect those who may have false eyelashes. If you’re the kind of girl who invests in beautiful eyelashes every two weeks, look at this product as an investment to maintain your lashes while you sleep through the night. Great for future brides and bridesmaids as well, this mask will keep your eyes fresh for the big day. Although this mask offers a wide selection of color options, keep in mind it is best to look for darker tones that will be less likely to let in light. Some masks only block the light from the sun, but the Dream Essentials Sweet Dreams mask also eliminates any light coming from your TV, computer screens, or your partner using their phone at night. If you have medical issues such as insomnia, this product may just end up becoming your best friend. Also great for those whose spouses get up early for work in the morning, the Dream Essentials mask will put you back to sleep within minutes. Which of These Masks Is Right For Me? Out of all these suggestions, you might be feeling a little overwhelmed. Which of the best masks will serve the purpose of your personal needs? Well, for your migraines the IMAK Compression Pain Relief Mask would be your best bet. It’s the only mask on this list that has cooling beads inside for pain relief. For migraine sufferers, the cold sensation helps to relax tension in the face and neck that is often associated with these severe and long lasting headaches. This product as had the least amount of complaints from customers who bought it for this purpose, the strap wearing out over time being the only problem; however, this is common after using any mask for a long period of time. 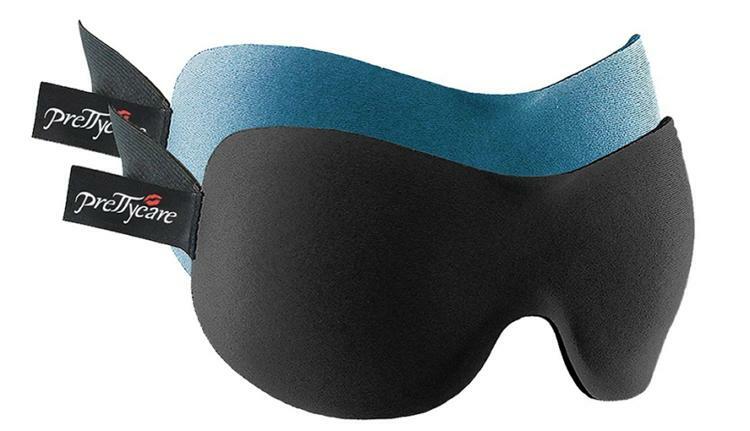 If you’re just a light sleeper, try the Sleep Master Sleep Mask. Sometimes a mask alone is not enough, you should consider purchasing a pair of earbuds as well. Don’t spend extra money searching for them, this one comes with a set and a carrying case! Take your product with you wherever you go so that you can sleep peacefully while your spouse is getting ready for work or using the television as a lullaby. There are several different brands that have similar products, but the Sleep Master Sleep Mask is the highest rated and most often purchased online. Additionally, the hypoallergenic material will be especially helpful if you have problems with harsh dye and unwashed cloth. Occasionally, people who purchase sleeping masks complain about redness, itching, and irritation after using them because the material isn’t skin-friendly for everyone. Allergic reaction will never be something to worry about, and you can share it with others, confident that it will be safe for them to use as well. When purchasing a sleeping mask, it is very important to go over the list of considerations and carefully choose your product. One of the main factors to look into is whether or not you have allergies; reactions to dye and specific kinds of materials can be very serious if precautions aren’t taken. Check labels and be sure to buy a hypoallergenic materials that’s won’t rub off on your clothes and skin, failing to do so could have serious consequences. Most masks are safe, and usually only light reactions occur such as a small rash or itching, however it’s best not to take the risk. Keep the original packaging for any and all items that may have been included in your purchase. Most companies require that you keep the package in order to return or exchange for their product in order to properly document the item, especially if you have a warranty. It is not always a requirement, but it is recommended. 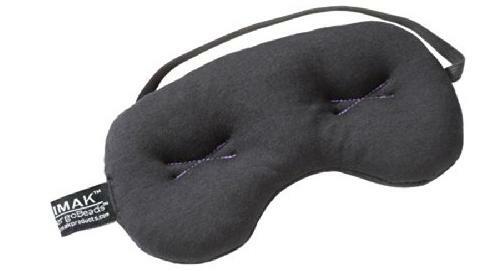 Thanks for posting about the eye mask for sleeping that helpful for skin beauty and better sleep.